This recipe's origin is the Big Texan Steak Ranch in Amarillo, Texas. Our variation stays true to the colors and flavors of fresh ingredients. For the pineapple salsa, in a medium bowl gently stir together the pineapple, mandarin oranges and sweet pepper. Drain excess juice. Stir in the picante sauce and set aside. Trim any fat from steak, then thinly slice across the grain. Sprinkle steak slices evenly with chili powder, salt and pepper. 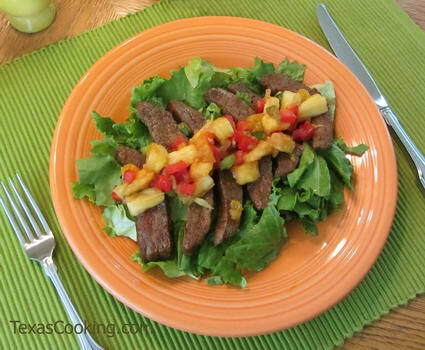 Arrange salad greens on plates, then top with steak and salsa. Note: Flank steak is often used for fajitas, but this recipe makes excellent use of this fairly tough cut of meat. It isn't necessary to comb through all the flank steaks in the meat counter to find the one that weighs exactly one pound. If your steak weighs more (1.25 to 1.4 pounds), the only adjustment necessary is additional seasoning. Meat slicing tip: Put the steak in the freezer for about ten minutes before slicing, and it will be much easier to slice thinly.